Watch Our Presentation on YOUTUBE! 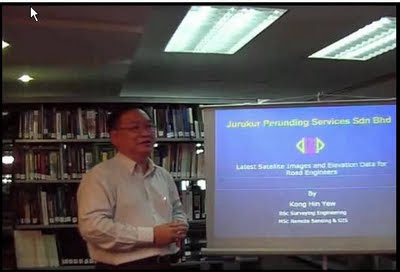 As mentioned in my earlier post on my presentation titled "Satellite Imagery & Elevation Data for Malaysian Road Engineers" to the Road Engineering Association of Malaysia (REAM) at their Library Talk on 8 August 2009, the whole presentation was video-taped and is now available on YouTube! Conducted from 29th September to 1st October, this long awaited exposure fulfilled part of the stringent requirement of Navcom Technology Inc. for their authorized dealers to be equipped with in-depth technical knowledge of the products and solutions that are being offered for the region market. This particular round of briefing was subsequently scheduled to coincide with both the official release of the latest SF3050 multi frequency GNSS receiver and the arrival of the first two units at our Puchong office in Malaysia. The trainer, Mr Steve Ault, happened to be Navcom's Product Support Manager. Backed with decades of knowledge and experience in GNSS and RF technologies, Steve was more than qualified to provide intense yet personal hands-on training for about a dozen of our sales/technical support staff and field surveyors. With the newly acquired knowledge and dedication, we shall now work towards providing excellent customer support to purchasers of the Navcom range of GPS/GNSS products such as the SF3050 and Starfire SBAS service. About the SF3050 and Starfire: Besides various standard positioning modes (such as cm-accurate RTK and high precision static survey), these receivers with built-in Starfire global high accuracy real-time differential GNSS service can also determine in real real-time at decimetre level accuracy X/Y and Z positioning of points at any location and time around the world without having a need for a base station. Obviously, this capability will be a great help in many survey and mapping works. By removing base station and post-processing work, it can only means greater productivity gains, smoother work flow, increased freedom, convenience and work satisfaction for your field and project teams. It has also opened up avenues of new applications, some of which had not been thought of previously especially in the local market context. Contact us for a presentation or demonstration. Our office was honoured with a technical visit by the Young Surveyors Group of the Hong Kong Institute of Surveyors on 2nd October, 2009. This group of about thirty young professionals was led by the YSG Vice Chairman, Mr Jeffrey C. H. Wong. The visitors (consisting of quantity surveyors, property consultants and valuation surveyors, building surveyors and general practice land surveyors) were briefed on selected topics of interest, namely, local West Malaysian licensed land surveying practices, the array of products & services currently being offered by our company, and advances that are being applied in our line of geomatics work. Their visit ended with a tour around our office complex.